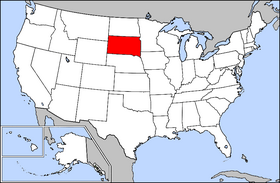 South Dakota is a state in the high plains of the northern Middle West in the United States. It is named after the Lakota (Sioux) American Indian tribe. South Dakota was admitted to the Union on November 2, 1889. North Dakota was admitted on the same day. South Dakota is bordered to the north by North Dakota, to the south by Nebraska, to the east by Iowa and Minnesota, and to the west by Wyoming and Montana. It is one of the six states of the Frontier Strip. USS South Dakota was named in honor of this state. The state is divided into 66 counties. Human beings have lived in what is today South Dakota for at least several thousand years. French and other European explorers in the 1700s encountered a variety of groups including the Omaha and Arikara (Ree), but by the early 1800s the Sioux (Dakota, Lakota, and Nakota) were dominant. In 1743, the LaVerendrye brothers buried a plate near the modern capital Pierre (Pronounced "peer") claiming the region for France as part of greater Louisiana. In 1803, the United States purchased territorial occupation, plundering, and settling rights of Louisiana from Napoleon, though the native peoples inhabiting most of this area could hardly have been aware of such a transaction. In 1817, a Euro-American fur trading post was set up at present-day Fort Pierre, and this was the beginning of continuous Euro-American settlement of the area. Through much of the 19th Century, exploratory expeditions such as those of Lewis and Clark and Joseph Nicollet coincided with an increasing presence of the U.S. Army. In 1855, the U.S. Army bought Fort Pierre but abandoned it the following year in favor of Fort Randall to the south. White settlement was, by this time, increasing rapidly, and in 1858 the Yankton Dakota Sioux resigned to signing the 1858 Treaty, ceding most of present-day eastern South Dakota to the United States. Of this, Yankton leader Strike-the-Ree said "The white men are coming like maggots. It is useless to resist them.... Many of our brave warriors would be killed, our women and children left in sorrow, and still we would not stop them." Land speculators founded two of eastern South Dakota's largest present-day cities, Sioux Falls and Yankton, in 1856 and 1859, respectively, and in 1861, Dakota Territory was recognized by the United States government (this initially included North Dakota, South Dakota, and parts of Montana and Wyoming, but later only North Dakota and South Dakota). Colonial settlers from Scandinavia, Germany, Ireland, and Russia, as well as elsewhere in Europe and from the eastern U.S. states, increased from a trickle to a flood, especially after the completion of an eastern railway link to the territorial capital of Yankton in 1872, and the discovery of gold in the Black Hills in 1874 during a military expedition led by George A. Custer. This expedition took place despite the fact that all of Dakota Territory west of the Missouri River (along with much of Nebraska, Montana, and Wyoming) had been granted to the Sioux by the Treaty of 1868 as part of the Great Sioux Nation. The Sioux declined to sell mining rights or land in the Black Hills, and war broke out after the U.S. failed to stop white miners and settlers from entering the region. Sitting Bull and Crazy Horse were major resistance leaders, but with greater numbers and superior weaponry, and with the sharp decline in numbers of the buffalo (a major food source of the Sioux), the Euro-Americans were unstoppable. Indeed, between 1878 and 1886, the Euro-American settler population of eastern Dakota Territory tripled. The last major incident in this struggle occurred on December 29, 1890 at Wounded Knee Creek in present-day western South Dakota when U.S. soldiers massacred about 200 unarmed Sioux men, women and children. Just over a year earlier, on November 2, 1889, Dakota Territory had become the modern states of North Dakota and South Dakota after a dispute between Euro-American settlers in northern and southern regions over the location of the state capital (originally Yankton but surreptitiously moved to the present-day capital of North Dakota, Bismarck). South Dakota politics are generally dominated by the Republican Party and the state has not supported a Democratic presidential candidate since 1964. In 2004, George W. Bush won the state's 3 electoral votes by the overwhelming margin of 22 percentage points with 59.9% of the vote. There are only five reliably Democratic counties in the state, most of them with primarily American Indian populations. Republicans have won the last seven gubernatorial elections and have controlled the legislature, with one brief interruption, for over thirty years. Democrats have been successful in winning election to Congress from South Dakota, most notably Tom Daschle. According to the U.S. Census Bureau, as of 2004, South Dakota's population was 770,883. The population of South Dakota grew from 696,004 people in 1990 to 770,883 in 2004, a 10.8% growth. The five largest ancestry groups in South Dakota are: German (40.7%), Norwegian (15.3%), Irish (10.4%), Native American (8.3%), English (7.1%). German-Americans are the largest ancestry group in most parts of the state, especially in the east, although there are also large Scandinavian populations in some counties. American Indians, largely Sioux, are predominant in several counties. 6.8% of South Dakota's population were reported as under 5, 26.8% under 18, and 14.3% were 65 or older. Females made up approximately 50.4% of the population. The median income for a household in the state is $35,282. The per capita income for the state is $17,562. 13.2% of the population is below the poverty line. South Dakota, in common with five other Midwest states (Nebraska, Kansas, Oklahoma, North Dakota and Iowa), is feeling the brunt of falling populations. 89% of the total number of cities in those states have fewer than 3000 people; hundreds have fewer than than 1000. Between 1996 and 2004 almost half a million people, nearly half with college degrees, left the six states. "Rural flight" as it is called has led to offers of free land and tax breaks as enticements to newcomers. State insect: Honey bee - Apis Mellifera L.
Harney Peak, in the Black Hills, is the highest point between the Rocky Mountains and the French Alps. More than 70,000 people hike to its 7,242 foot summit each year. The ashes of Dr. Valentine McGillycuddy, the first white man to climb Harney Peak, are sealed in a crypt at the top of the mountain. The deepest mine in the United States, the Homestake gold mine (now defunct), is in the Black Hills of South Dakota, near the town of Lead. Its shaft plunges more than 8,000 feet beneath the surface. From 1969 until 1993, it was home to the Homestake Chlorine Solar Neutrino Experiment, famous for detecting the solar neutrino problem. Currently there is pending legislation that would give the mine to the National Science Foundation for use as an underground research laboratory. South Dakota is home to the largest indoor, naturally heated, swimming pool in the world. Evans Plunge, heated from natural mineral springs, is in Hot Springs. The Black Hills of South Dakota was one of the sites considered for the permanent home of the United Nations. The largest and most complete fossil of Tyrannosaurus rex ever found was uncovered near the city of Faith, in 1990. Named "Sue," the remains are over 90 percent complete. Citibank rechartered itself as a South Dakota bank in 1981 to take advantage of a new law that set South Dakota's maximum permissible interest rate on loans to 25 percent, then the highest in the nation (New York had refused to raise its interest rate even after prolonged lobbying). However, South Dakota's dreams of becoming a major financial center were dashed when Delaware matched its move the next year, and banks in search of the right to charge high interest rates flocked to Delaware instead. The 1990 movie Dances With Wolves, starring Kevin Costner as Lt. John Dunbar, was shot entirely in South Dakota. South Dakota license plates are numbered by county, with the first digit referring to the county of origin. Such a numbering system allows one to easily determine where the vehicle was registered. Counties 1-10 are ranked, roughly, by population. 11-67 are numbered alphabetically.